Program Note: Where we stand, have sto od many others. Layers of unmentioned history lay dormant under our feet. What secrets have past civilizations left behind? Buried rooms filled with bones, passages with faded warnings, ghostly whispers leaking through the cracks in the sidewalks? There are mysteries that lay beneath the hubbub of our modern world. Monks Mound was conceived in collaboration with visual artist, Aaron Renier. 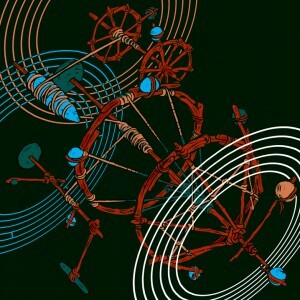 His artwork is paired with Monks Mound on the Ten x Ten: 2013 vinyl release. It was written for the Palomar Ensemble as a part of Ten x Ten: 2013, a collaboration between Access Contemporary Music, Homeroom Chicago, and Spudnik Press.